As Canada's attention is increasingly focused on the polarizing oil exports debate, another contentious energy export has been quietly gaining momentum. The humble wood pellet, once used mostly for small-scale home heating, has graduated to an alternative to coal in the hungry power plants of Europe and Asia with the disputed promise of carbon neutral energy. 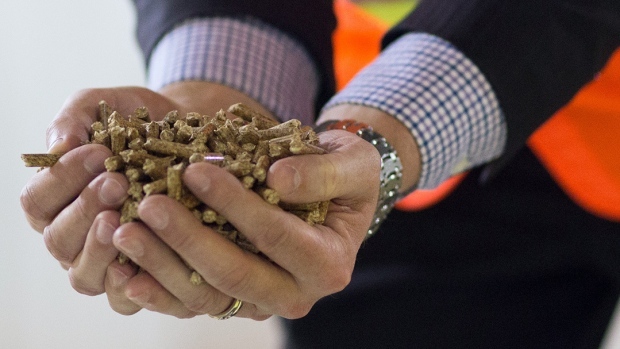 Foreign demand has spurred the growth of operations across Canada, as companies look to make use of waste wood to produce about $500 million a year worth of the product, said Gordon Murray, executive director of the Wood Pellet Association of Canada. "It was big in B.C., and then a few Alberta plants got involved, and then also in the Maritimes, and now we've got plants in almost every province." Exports jumped by 46 per cent in 2016 compared with a year earlier to reach 2.4 million tonnes, according to the National Energy Board, while companies have since continued to make investments to further boost production. Pinnacle Renewable Holdings Inc., which went public with a $150-million initial public offering in February, has built a specialized wood pellet terminal in Prince Rupert, B.C., and is working on a 400,000-tonne-per-year pellet facility in Entwistle, Alta. and a 125,000-tonne-per-year plant in Smithers, B.C. The company also says it has a few hundred thousand more tonnes of capacity in mid-stage design and engineering, plus over a million tonnes of early stage projects across North America. The increasing capacity in Canada will help meet demand from both power generation and heating segments that is expected to grow from about 30 million tonnes globally as of last year to 70 million tonnes by 2025, according to industry analyst William Strauss. He forecasts Japan and South Korea will account for much of the increased demand, along with growth from the Netherlands, the U.K. and Denmark as the EU has set a goal of having 35 per cent of power sourced from renewables, including carbon neutral-designated biomass. Wood pellets are considered carbon neutral because as forests grow they can retrap carbon, but the designation has drawn criticism from environmentalist and academics who have questioned the equation. John Sterman, a professor at the MIT Sloan School of Management, published a paper earlier this year that argued burning pellets would release more carbon dioxide than coal in the short term because it was a less efficient source of energy. The lag for when the carbon would potentially be reabsorbed to eventually make it carbon neutral is too long when emissions reduction is needed now, said Sterman in an interview. "The next few decades, the rest of this century, this is the critical period," said Sterman. "Biofuels, and especially wood pellets, actually worsen climate change over this period." There are also significant concerns about the reliability of the forest retrapping the carbon, since climate change is expected to increase the risks of forest fires and insect infestations, said Sterman. "The EU has made this error, and accounting error. It's just a false statement to say that biofuels are carbon neutral. They're not neutral in the short run, and whether they're neutral in the long run depends on the fate of the land." Murray at the pellet association says such criticism is unfounded, with Canadian wood pellet production coming from waste materials like wood chips and sawdust from the lumber mills. "That material is already being harvested by the sawmill industry...so instead of wasting it, we're using it to displace a fossil fuel," he said. The EU has also emphasized that wood pellets should be sourced if possible from waste material, since pellets from whole trees have been found to have a much greater impact on total carbon released. But some have questioned the effect of even burning wood from waste, including a paper out in February by Mary Booth, director of the Partnership for Policy Integrity, a public advocacy group. Booth noted that while net emissions from whole tree pellets were substantially higher, her calculations found that 40 years after pellets were burned, their emissions still meant more carbon dioxide in the atmosphere than had been retrapped by growing trees. Murray argues that academics and environmentalists who challenge the carbon neutral designation don't understand how the industry works. "As long as that forest is growing at a sustainable rate, you're actually replacing that carbon the very same day. The forest is growing continuously, and as long as you're taking less wood out of the forest than you're combusting, you're better off." While the debate continues over how to best measure its carbon impacts, the industry expects years of continued growth as power producers try to move away from coal while keeping reliable sources of power.